As part of my final project, I was interested in the way health care and health care related information is provided on smartphones. Because I am interested in mental health care, I looked at apps relating to mental health care in particular. Moreover, because Google’s Android system and Apple’s iPhone currently dominate the majority of the smartphone market, I compared the results of my project on both markets. One purpose of my research is to investigate how people access apps in pursuit of mental health services. To investigate this, I compared results for various search terms related to popular mental health concerns. 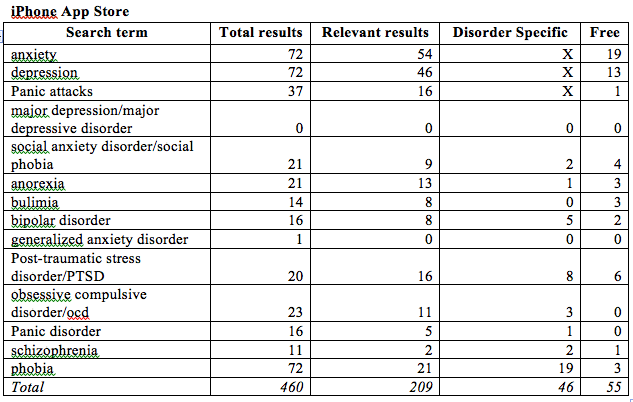 These included general symptoms such as depression, anxiety, and panic attacks, as well as specific searches for ten of the most common mental disorders, such as major depressive disorder, social anxiety disorder, and anorexia. Side by side comparison of results between the Android Market and the iPhone App Store. 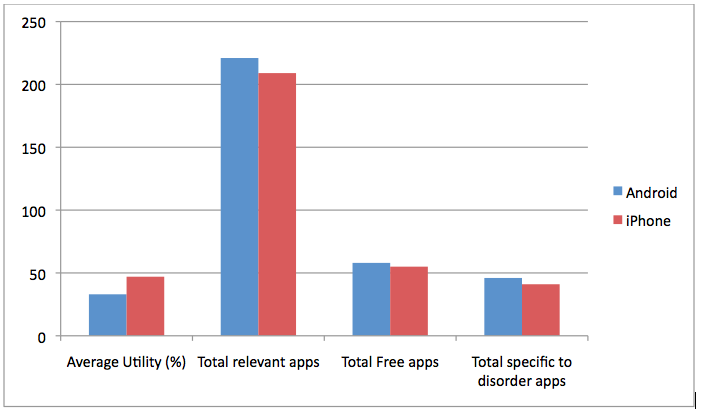 Average utility refers to the number of relevant apps compared to total apps for all searches. First, the Android surpassed the iPhone in how many total apps were produced for each search term and in each search category. This reflects the fact that, for each search term, I found that the Android was generally much more responsive to general terms in producing associated applications, however, the iPhone was better at returning more relevant apps, as indicated by it’s higher utility value. Though the Android was much more generally responsive to search terms, it appears as though the iPhone was much better at only returning relevant apps. It seems as though the Android may bloat the number of relevant apps presented to the individual conducting a search. This could frustrate users seeking help, which in turn may repel individuals seeking help from doing so on the Android platform. iPhone users, and in turn, developers, may appreciate the ease of use and lack of clutter provided by the App Store. 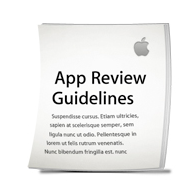 Apple's App Review Guidelines may have something to do with this. The Android Market currently has no equivalent. Another important result to highlight is that the Android surpassed the iPhone in the availability of apps tailored to the alleviation of a specific disorder. In nearly every case, the Android returned more overall apps than the iPhone did. The case of GAD and Major Depression were most notable in that the iPhone failed to recognize any relevant results, while the Android proved mildly successful. Because the iPhone did respond to and produce results tailored specifically to “depression,” this may not reflect an availability issue, but rather an accessibility issue with the way the search engines return information. Because there were significant differences between both platforms, and some clinicians acknowledge this to promote the use of one platform like the iPhone, there are several potential implications. A clinician I work with told me that the iPhone is the preferred platform, for him and for others, in releasing mobile mental health care services mostly because of the ease of use and accessibility of the iPhone. But Apple products are typically more expensive than Android equivalents, and this difference in population may further promote the divide between individuals who seek mental health care. Financial concerns are one of the obstacles to accessing mental health care. If the iPhone comes to dominate the use of mobile mental health care, then this could alienate individuals who seek access to mental health care on apps but for whom financial troubles prevent access to both the iPhone and professional mental health services. In this regard, it is also worth mentioning that the Android market provided more free apps. If developers move to the iPhone, accessibility for those who have an Android device may further decrease. Moving forward, one thing that would be important to look at is issues of legitimacy of apps like these. In professional mental health care, government law and agencies, high barriers to entry into mental health care fields, and peer review processes help us determine who is a trusted clinician and what forms of therapy are valid. For example, Twitter provides an excellent example of this: Twitter allows users to mark their profiles as “Official” in order to prevent fraud or misattribution of information. Such a similar feature could likely be presented in the future for apps mental health apps, as they are a sensitive issue. For now, however, most likely most people will rely on proxy sources like official consumer reviews and news, such as from the New York Times, and suggestions from doctors or therapists on which applications to seek.